We have all come home with items that we later wish to return (The Ped Egg, do it yourself enema kits) but one Tennessee family has decided to return a child that they adopted from Russia. The dissolution of a finalized adoption is rare (some statistics put it at less than 1%) and involves several complicated legal proceedings that Grandmother Nancy Hansen did not wish to bother with. So she did what any self-respecting guardian would do; she took to the Internet in search of sound legal advice. She located an online attorney that reportedly told her to put the kid on a plane to Russia and those other pesky details would fall into place. Obviously concerned with the child’s well-being, Nancy bought a one-way plane ticket and hired a Russian driver name Arthur to pick him up and drop him off at the Russian child protection ministry. When the child arrived unannounced, the Russian government was so angry that they immediately shut down all American adoptions of Russian children until a new agreement between the two nations can be ratified. So what reason could the family possibly have for such behavior? The Grandmother claims that the 7 year old was violent and borderline psychotic, even taking the time to pen a “hit list” of family members that he wanted to kill. The final straw was when Nancy walked into the bedroom and saw the young man setting fire to some paper which she surmised was part of a plot to burn down the house and kill the entire family. The boy’s adoptive Grandmother claims that the young man confessed to burning down a building next to his Russian orphanage and admitted to other violent tendencies that they feel should have been disclosed to them before the adoption was finalized. 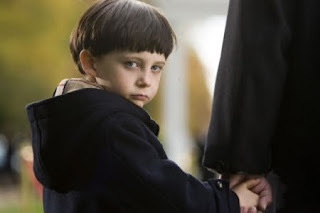 · Assuming that this Tennessee family did in fact adopt Damien from The Omen as they claim, I am sure that a dissolution proceeding would illuminate this and allow the proper channels to prepare for his return and arrange for psychiatric treatment. The family claims that the kid was so disturbed that he was plotting assassinations after his daily nap, yet they never filed a complaint with the adoption agency. Russia is a country, not a vending machine for toddlers. · I also love that she hired a driver to pick the kid up based on his positive Internet reviews. It is nothing short of a miracle that this child arrived at his destination unharmed. This woman hired a man she did not know to pick up an undocumented orphan and took his word for the fact that the boy would ever be seen again. On a side note, Arthur does not strike me as a traditional Russian name but I am probably just being paranoid; after all people don’t lie on the Internet. · Where was the actual mother who adopted the child? It appears that all decisions concerning the young man’s future were made by cyber-granny and the mother’s contribution was reduced to writing a letter that indicated that she no longer wanted to “parent this child.” Maternal instinct fail. Obviously we cannot know all of the circumstances behind the Hansen’s decision to put their adopted son on a plane, but their thoughtless actions have jeopardized thousands of Russian children who are waiting to be adopted into American homes. I just hope that Tennessee’s new claim to fame will not be reigniting the Cold War.